Over the years my wife and I have inherited, bought and scavenged numerous items that we feel we may use someday or are just keeping because it feels wrong to sell or dispose of them. Over time boxes of historic family photos get inherited, numerous "family" sets of china are acquired and a few sets of outdated silver. All of these items need to be stored and not nessisarily somewhere that needs to be accessed often. Most if not all of these items also dont need to be stored in a heated storage location. 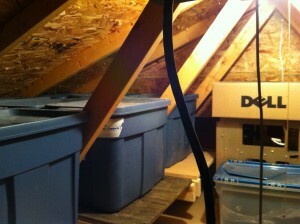 This is where my garage attic started to look appealing to me. There were a few problems to overcome. The garage roof is 15 feet above the garage floor and I didn't have a way to get heavy items into the attic. The atttic had insulation and no where to set heavy storage boxes. There was only a small opening in which to bring up materials. First I found a way to wire a light and outlet into the attic by pulling power from an existing line that was run through the attic. This gives me a light fixture with a simple pull string to turn off the lights as well as an outlet to run tools/etc throughout this process. 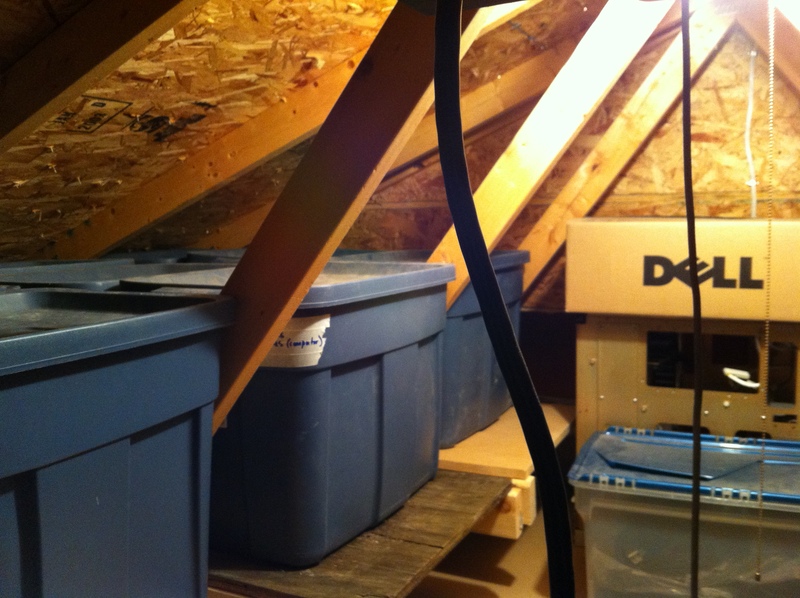 The attic has trusses spaced apart with an opening in between where I put the walk way. I started by cutting 24" wide sheets that were almost 4 feet long because they would fit through the attic opening. These were then screwed down to create a floor that could be walked down in the center of the attic. To create the shelves required to put the totes on I screwed horizontal 2x4's about 8" over top of the insulation to give it some room to breath. These 2x4 screw directly to the roof trusses and give them a little extra strength at the same time. I then cut up all the plywood/MDF scraps i had around to create platforms that would sit on top of the 2x4's. I found that 3 totes could fit in between two trusses on each side. 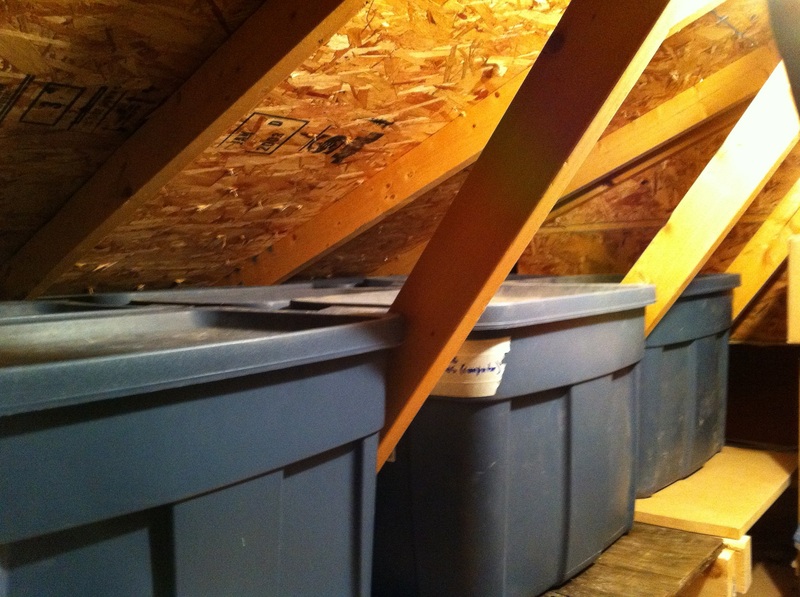 This meant that I could store 6 totes for every 2 feet of attic length. 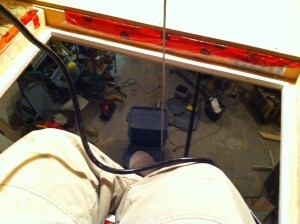 Now to solve the problem of being 15 feet in the air. 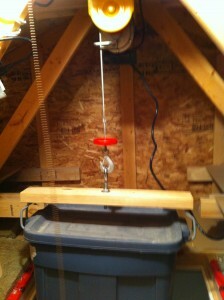 I purchased a 110Volt winch and wired it into the attic outlet that i had created earlier. 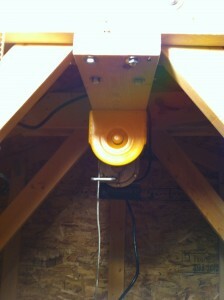 I then lagged two 2x6 boards into the existing truss's and a third lagged two the previous two to mount the winch. 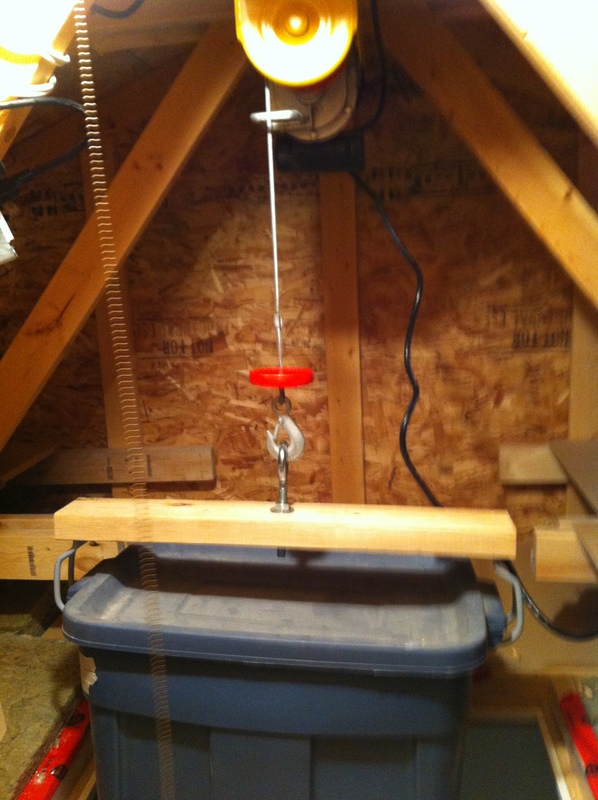 The winch then mounts to the 2x6 bridge by bolting directly through the 2x6. I built this strong because I may use it as an engine hoist in the future as the garage placement of this attic hole would work perfect for an engine hoist. I then built a simple rig for lifting Rubbermaid totes. This is simply a 2x4 with an eyelet mounted in the middle and 4 garage tool hanging brackets screwed into the end that could grab the handles on the sides of the tote. Using this system one person in the attic can lower the winch to the floor where a second individual hooks the rig onto the tote so the attic worker can raise the tote up. Then they can be swung onto the attic floor where the rig can be removed and the tote moved to a shelf. I have hoisted up totes over 100Lbs of china in them without incident. This system served its purpose well and i would recommend a similar setup.